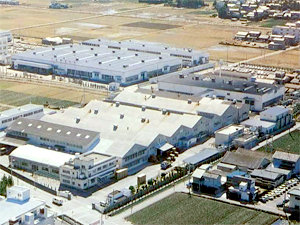 Our next task was to increase yearly production to 300,000 units and was assigned to us by President Koike himself. Our product lineup still had no models above 60 hp, and looking at our sales network, assigning us such a lofty target seemed unthinkable at the time. However, with such a clear goal to aim for, once we got to work and had each department devise plans for what would be necessary to achieve it, what needed to be done became obvious—peculiarly so. “Alright, let’s do it!” was our rallying cry and everyone at the company strove to meet the goal. The engineering division would do everything they could to beef up the lineup and marketing would work to reorganize and streamline our sales network. But the factory was going to be particularly hard; we’d have to make a major investment and set up a new facility. In simple terms, we needed to construct a new outboard assembly factory. But we actually had no open land on which to build it, so our only alternative was to renovate the single-floor Building No. 2 into a two-story building and make additional lines for painting and assembly. The catch was that if we were to do this, construction of the new floor would need to be done without interrupting Building No. 2’s operations! Build a whole new second-story floor of a factory without ceasing production on the first floor? Talk about a serious challenge! We consulted with Tobishima Corporation and they agreed to take on what we all knew was an unreasonable project; it ended up being a very difficult job. The construction project was called “Plan N” and the work was separated into Stage 1 and Stage 2. Stage 1 was implemented in 1979 and Stage 2 in 1981. While there were a few disruptions to production during those periods, in 1982 the new two-story Building No. 2 went into full operation with all the various manufacturing equipment in place. Yamaha’s outboard motor factory was the first of its kind in the world to employ overhead conveyors. We also had a maintenance building erected next to Yamaha’s marina on Lake Hamana, our base for testing outboards mounted on boats. All these new buildings and bigger facilities were going up before our eyes, making the employees feel that their company was really growing and spurring an ambition that was reflected in their work. The result of all this investment was sales beyond what we predicted and we were able to massively increase our production numbers. We now offered big outboards in the 85 hp to 115 hp range, yearly production was up to 230,000 units, and the average horsepower class of outboards we had on the lines was higher. In only four years, we’d achieved our goal of 300,000 units in annual production (with an average outboard horsepower of 25). Back when Plan N was first set in motion, the company made massive investments which significantly exceeded the scope of our sales and profits, knowing full well that it was money going toward the business’ future. 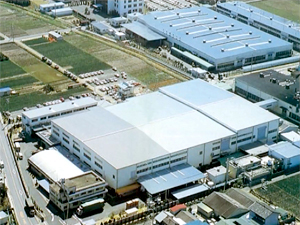 However, these investments actually became the source of Sanshin Industries’ later profits. In a strange twist of fate, the year we completed Plan N and reached two million outboards in cumulative production was the same year the joint venture was dissolved. The next task we faced after Plan N was to launch Yamaha outboards in the U.S. In the words of President Koike at the time, America was “the market Yamaha outboards had saved for last.” The U.S. was the most significant market for outboards in the world and if an outboard was highly rated there, that meant it was undoubtedly a first-class product. Accomplishing exactly that was our dream for many years. To turn the clock back a bit, at official board meetings while Sanshin was still a joint venture company with Brunswick, no development of any large outboard was ever approved. However, with the American market being our ultimate goal, large outboard models—especially ones with V6 engines—would be absolutely essential and I knew we needed to develop them as soon as possible. However, it would be a tall order without cooperation from Mercury and we lacked the confidence to tackle such an undertaking. If we were going to do it ourselves, our only option was to first build a prototype and use it as a basis for study, and that would inevitably consume considerable time. I determined that we had no choice but to get started immediately, and in August 1976, I assigned two of my most hardworking and talented engineers—Yamamoto-san and Matsumoto-san—to handle the R&D for the project. This was three years after the joint venture was formed and before we’d started production on our new 40 hp model. I personally made the decision to start the project and we kept it a secret even from Yamaha’s board of directors. We decided to build our own 150 hp, 1,800cc V6 engine and got to work on the prototype using the V6 engines from Mercury and OMC as references. One year later in mid-1977, we managed to complete a prototype V6 outboard. Though it was far from perfect, it turned out reasonably well for a first attempt. When we began running the prototype on the dynamometer for performance testing, it revealed all kinds of problems. We addressed them as they appeared while running further tests over and over. At some point, we somehow reached the performance targets we had set. Gazing at the first V6 outboard engine we ever built on our own, we slowly began to realize that we could in fact build one without technical assistance from Mercury. I drew up and proposed a development plan for a line of new outboard V-engines. Getting approval from Yamaha Motor’s board of directors this time, we started developing new V4 and V6 outboards aimed at the U.S. market. Of course, this was all done without approval from joint venture Sanshin’s board of directors. This was all back in early 1978. Not long after that, the Federal Trade Commission issued their complaint against the joint venture. Seeing that the joint venture might be dissolved, this accelerated our work on the V-engine project. Our aim with developing the V4 and V6 engines was naturally to offer more performance than those made by OMC and Mercury, so we determined the specifications for our engines based on extensive comparisons with their engines. The production of big 2-stroke V-engines like these would obviously be a first for Sanshin, but even Yamaha Motor had never done this before. The equipment required for full-scale production of such engines would also be extensive. After much study, it was decided to develop the V4 and V6 as a series, considering the development efficiency and production issues we were facing. For their specs, both engines would share the same bore and stroke, with the V6 simply getting two more cylinders. This meant that both engines could use exactly the same pistons, connecting rods, etc. The styling and design would be uniform for the series, meaning that the bottom cowling, upper casing, lower unit, brackets and controls would all be the same. Developing the V4 and V6 as a series rather than as separate models was beneficial in many ways. The required investments in molds and equipment were easier to clarify, production issues could be quickly addressed and we could also efficiently relay feedback to the engineers. This facilitated common solutions to development problems for both engines. At the time, the investment needed to develop a new 120 hp outboard—including all the dies, equipment and jigs—was several hundred million yen. For the V-engine series development project, while the investment for the V4 (the first model in the series) was nearly twice that, the V6 only cost around 40% of what it took to build the V4. So even when totaling the investments for both the V4 and V6, it stayed under three times the cost of developing a new 120 hp outboard. I’m sure that it would’ve been much costlier had the engines been developed separately rather than in series. Large-displacement engines like these required a different approach to design than what we had for mid- and small-class outboards. After studying the V6 engines from OMC and Mercury, we realized that many of the parts were made small, with only minimal margins for component strength and similar factors. When building outboards based on our own engineering experience, our engines always ended up larger and heavier than the V-engines from OMC and Mercury, two massive disadvantages when it came to an outboard’s competitiveness as a product. This fact all but forced us to design our engines with small parts and component strengths similar to OMC and Mercury. When you move from design to actually building a prototype, unsolved problems become much more conspicuous. The crankshaft in particular gave us a lot of trouble. After machining our one-piece cranks from a single rod of steel, we then carburized and quenched them. But all our work to ensure dimensional precision during the machining stage was for naught; the carburizing/quenching process would cause the crankshafts to deform, and each to a different amount. Only after repeated modifications to correct this did the crankshafts become acceptable for use. After that it was the engine block. The cylinder block for our V-engines used Schnüerle loop scavenging for the best performance, but just to create its technical drawings was a very complex task and it required considerable time to comprehend its construction three-dimensionally. 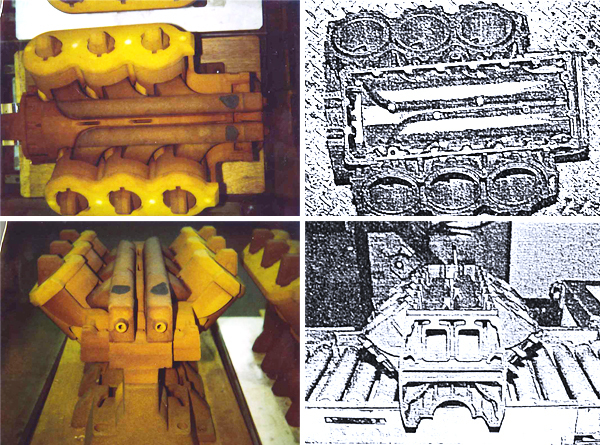 It took an immense amount of time and effort to create the wooden casting mold and complete a trial casting. In comparison, the OMC and Mercury V-engines used a simpler cross-flow scavenging design. After the prototype was finally completed, testing started immediately and parts everywhere either broke or seized. This was a rude awakening for us, demonstrating how naïve we were to think that we could just up and build a prototype and somehow manage to successfully develop our own V-engine in one go. This marked the start of day after day of trial and error, and the slow pace meant it took considerable time until we had the engine ready for production. With the bearings for example, they would quickly fail during testing despite meeting existing standards. So we went to the bearing manufacturer to find out what was wrong. “There’s no way a bearing of this size will hold up under those conditions. You need the next size bigger,” they said. But going one size bigger meant that the engine itself had to be made a size bigger, which would make it larger and heavier than the OMC and Mercury engines. So we somewhat selfishly asked the bearing manufacturer the impossible: “Can you somehow make something the same size that will work?” They tried using different materials, changing the crowning and clearance for the needle rollers, tried various different heat treatments, etc. As these various small improvements grew in number, the durability of the bearings steadily improved in turn. Just as we’d suspected, when we tested the OMC and Mercury V-engines, it became clear that they also had some durability issues. This convinced us that we could build an engine just as good—if not better—than theirs. So we went to work, meticulously improving all kinds of parts in the same way we upgraded the bearings. 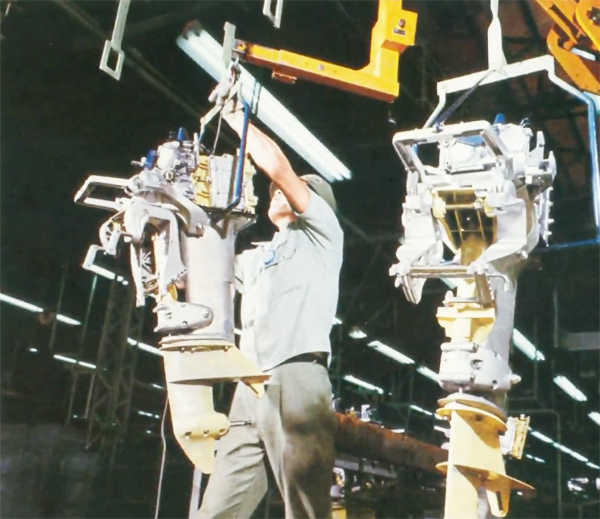 In June 1981, we were finally able to begin production of our 115 hp V4 engine. It took three and a half years after product planning began, and it had been five years after we first started working on a V-engine prototype. However, these five years were pivotal in establishing Yamaha’s large-outboard engine technology. It was all because we had no choice but to venture into realms of technology far removed from what we had for small and mid-size outboards. 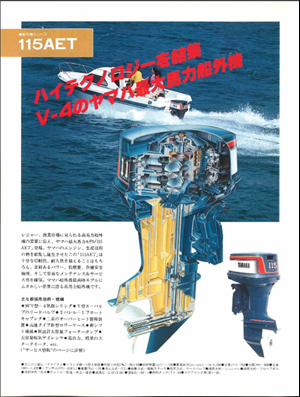 This 1981 advertisement introduces Yamaha’s big-horsepower V4 outboard that utilized a combination of cutting-edge technologies. Taking Yamaha’s 2.6-liter, 225 hp V6 outboard as an example, the engine alone weighs 94 kg, giving it a power-to-weight ratio of 1 hp per 0.42 kg. Our existing small and mid-size outboards had a ratio of approximately 1 hp per 1 kg. Compared to the 1 hp per 1.2 kg of a DOHC, 2- to 3-liter car engine, this is an incredibly lightweight and compact engine. Further, while the maximum rev limit is a relatively low 5,600 rpm since it’s a marine engine, it still produces an output of 87 hp per liter as well as very high torque with 1.2 kg•m per liter. And unlike engines used on land, marine engines are often operated at full throttle for extended periods, meaning that proper measures must be in place to ensure durability and to combat corrosion from seawater. Light weight and compactness are the two most important traits of an outboard. It was our ability to realize both that also made what was once unthinkable a reality—commercially available outboard engines producing more than 200 hp. One can almost go so far as to say that you can compromise on durability and reliability to a certain extent; I believe lightness and compactness are features holding even greater importance. 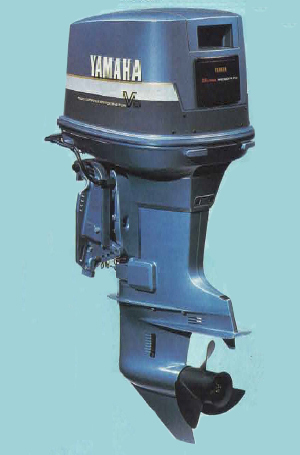 Yamaha’s 220 hp V6 outboard had the world’s lightest mass-production engine in its class when it was released. In the aforementioned process of building Yamaha’s first V-engine outboards and the wide-ranging and repeated trial and error that entailed, we came to a conclusion. We used to think of the entire outboard as a rigid structure when in fact the exact opposite was the case. When the engine is running, many of its parts and components change shape. Even the lower part of the outboard bears the weight of the engine, causing it to twist and deform. Once we started looking at outboards like this, we quickly began to understand the roots of many problematic areas. For example, we went to Gleason Corporation and studied their method for machining beveled lower unit transmission gears, but even when we designed and machined the gears according to Gleason’s standards (the same as for automobiles), the gear teeth would break after running the engine for only a few hours. The reason was that engine torque would cause the lower unit to deform when the outboard ran through the water, thus ruining the way the gear teeth would mesh. We solved this by machining the gears so that the teeth would mesh correctly even when the lower unit deformed. This meant we would machine our gears to have slightly offset mating surfaces. The large and small ends of the connecting rods also had to be specially machined to have as large a mating surface as possible for when the crankcase deformed as the engine ran. The approach was exactly the same for the crowning of the various bearings as well. Only with such extensive trial and error did we hammer out the details and decide on the shapes and dimensions for our outboard parts. The necessities of complex machining work and finding the right way to boost precision made us realize that we had to solve things in a different way than before. We also had much smaller margins for engineering tolerances, which narrowed down the range for what constituted optimal machine settings, and parts had to be machined with greater precision and with less variation. We learned that accumulating and applying this technical knowledge was what made our outboards more reliable than our competitors, even if the concept of the models were the same. It’s also thanks to this that Yamaha’s large outboards today enjoy a better reputation on the world’s markets than the competition. While I still personally don’t think of them as perfect, little by little I’m beginning to see the direction to go down for building such knowledge. Bringing Yamaha large outboards to market as a competitive product was a technical challenge unlike any we’d faced before, to offer the same durability and reliability in a smaller package. This was just one example of our experience as engineers, but if you can acquire a technology that can take the performance of any product a step further than the rest, you will without fail be able to maintain a level of superiority over competing companies. I have heard that there are many small to medium-sized companies in Japan whose products account for more than 60–70% of worldwide market share. These companies do things big corporations do not and are located in more rural areas of the country instead of the cities. Their products are mostly individual parts and are not seen as being particularly “high-tech,” but I understand it’s the wealth of specialized expertise these companies have regarding those very parts that keeps their products in such high demand. Though I do think it’s necessary to enter what are commonly called “high-tech” fields, if any company can easily replicate another company’s “high-tech” product or do so with sufficient investment, it isn’t a truly “high-tech” product. If your company is the only one in the industry manufacturing a product requiring not only cutting-edge technology, but also skills only acquirable with years of experience, then—by my definition—your company is undoubtedly “high-tech.” In that sense, one could say that the true task of any engineer is to make your company different from the rest through technologies you’ve created that solve problems like nobody else can.